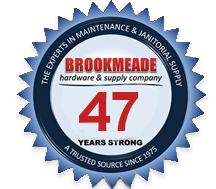 Brookmeade Hardware & Supply Company distributes janitorial and maintenance supplies. Examples range from paper products, liners, hand soaps, cleaning supplies, cleaning chemicals, industrial-laundry chemicals and air fresheners to gloves, light bulbs, appliances, water heaters, HVAC units and parts, plumbing parts, electrical parts, light fixtures, safety items, office supplies, and appliance parts. Brookmeade Hardware services the Middle Tennessee region and ships anywhere in the United States. The company targets a variety of markets with sales representatives calling on hospitals, nursing homes, industrial businesses, small businesses, schools, local government agencies, and the apartment industry. Partners and brothers, Bill and Mike Nourse founded Brookmeade Hardware & Supply Company as a True Value Hardware store in 1975 that sold traditional hardware items ranging from bolts and screws to spray paint and tools. To augment sales, Bill began making sales calls on apartment-maintenance shops, which was the beginning of the distribution side of the business. The company grew and in 1978, Mike left the business to become a very successful construction contractor in Florida leaving Bill as the owner. The company was incorporated that same year with Bill becoming the president and CEO. At that time the company hired a number of outside salespeople to continue to grow the distribution business while maintaining the retail outlet. In 1984, the retail business was sold and the distribution business was moved to a different, 4,300-sq.-ft. location in downtown Nashville. In 1988, after additional business growth, the hiring of additional salespeople, and expanding the delivery fleet, the company added 4,000-sq.-ft. of warehouse space. In 1992, Brookmeade moved into a 14,000-sq.ft. facility and in 1997 the company moved again into its present 30,000-sq.-ft. distribution center. Brookmeade Hardware & Supply Company is now a leading distributor of janitorial and maintenance supplies in Middle Tennessee and is distinguished from its competitors through superior service, quality of products and competitive pricing. Our vision is simple: to be Middle Tennessee’s leading distributor of maintenance and janitorial supplies. We are focused on one thing: anticipating and meeting the needs of our customers 100% of the time. We achieve this by providing our customers with quality products and superior service.